A Mars simulator in the Utah desert has captured the imagination of CMU students and staff alike. Diane Turnshek, a physics lab technician, lecturer and writer, never imagined spending Christmas on Mars until last summer when she heard about the Mars Desert Research Station. "It was the best sky I've ever seen in my life," she said. "No light pollution, brilliant Milk Way. There were no airplanes or contrails - no evidence of humans in the whole sky." She and Nora Swisher, a doctoral student in physics, applied for the same two-week crew stint in late December. While there, they met Dan Wilcox, a Master of Fine Arts student who was wrapping up his own two-week experience. The simulation program is run by the Mars Society from December through May each year. Teams of volunteers explore the surrounding terrain and conduct experiments. Turnshek, Swisher and Wilcox all received support for the experience through Carnegie Mellon, which included the College of Fine Arts, the School of Art, the Mellon College of Science and the Department of Physics. The experience is designed to help astronauts prepare for human exploration on the red planet. Swisher said oftentimes they completed normal tasks in unusual ways, such as cleaning and eating. "You have to approach cooking in a different way. You have a lot of dehydrated vegetables that you had to soak for 20 or 30 minutes beforehand and then cook them," Wilcox said. Because of the altitude of the site, water also boiled at a lower temperature. All of the water was trucked in to the site, so water conservation was important. Showers were quick, dishes were often left soapy and the hot water pipes were frozen for a few days. But even the extraordinary became ordinary. "We each had a day where we forgot we were wearing a suit, like the day when I tried to blow dirt off my pen while I had my helmet on," Wilcox said. "But of course you just fog up your helmet. And that's an interesting thing. It's such a big deal on the first day when you come and it takes an hour to put it on and then a week in, you don't even notice it." As many conditions needed to live on Mars were simulated as much as possible. While outdoors, the team wore spacesuits, entered and exited airlocks and tested all-terrain vehicles. resting and emailing friends and family. Any communications with the outside world included a 20-minute time lag. Turnshek, Swisher and Wilcox weren't the only ones with CMU connections to "visit Mars" this past year. During a January session, Simon Engler, a 2012 Robotics Institute Summer Scholar was there. Engler has worked on CMU astrobiology robotic projects being designed for a mission on Mars. Since leaving CMU Engler has been a member of the Hawaii Space Exploration Analog and Simulation (Hi-SEAS), which has been testing food designed to sustain astronauts on Mars and other deep-space missions. The trio said they would love for a full CMU crew to go to the station next year. Wilcox said the experience would be valuable particularly for freshmen and sophomores uncertain of what they want to do. "I could see them saying, 'I know what I want to do, I want to go to Mars,'" he said. "They would come out in awe." There are a lot of indirect advantages for space exploration, Swisher said. "We develop technologies for space but the same technologies can benefit people on Earth," she said. "Or it inspires young people to go into science and technology, even if they're not specifically working on space. I think there are a lot of scientists and engineers who wanted to be astronauts as kids." Turnshek said she'd like to take her writing students with her. She also serves as an adviser to a number of university clubs and helps organize trips. "I like to drag people out to cool things," she said. She added that she hopes their adventure will inspire more women to consider careers in science. Turnshek is using the experience to finish a young adult science fiction novel. Plus, she and Swisher have already lined up a number of presentations about the experience. Wilcox also is writing about the trip. He is using the experience as the basis of his thesis project "Onward to Mars," which includes a live musical performance with visual elements and a concept album about the theme of humanity crossing the sea of space and touching down on a familiar new world. His wife, Anika, also a media artist, is creating a spacesuit for the performance, which will premiere in April. But while they may have their eyes on the stars, there's still more on Earth they'd like to see. "Being in the desert and looking through the helmet really made me want to go look at all of Earth's other crazy, beautiful places," Swisher said. 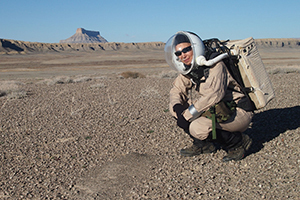 Teams of volunteers, including three from Carnegie Mellon this year, conduct experiments and explore the Utah desert as part of the Mars Desert Research Station program.